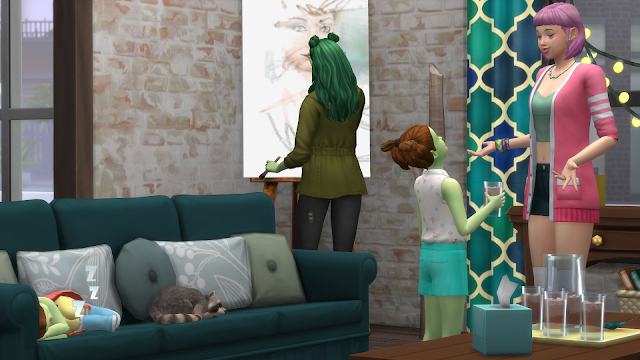 Onto Andy, Miko and Luna! 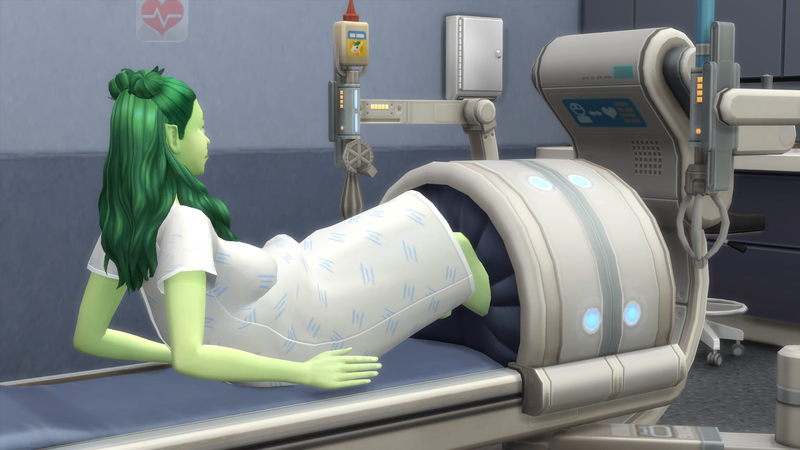 Who are all still alive, thanks to Jeff’s heroics earlier this rotation. 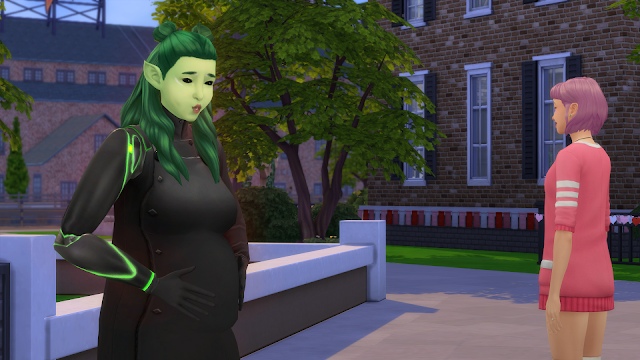 I wanted Andy and Miko to have a baby that could be friends with Jeff and Alec’s kids, so I had Andy get pregnant at the start of the rotation. 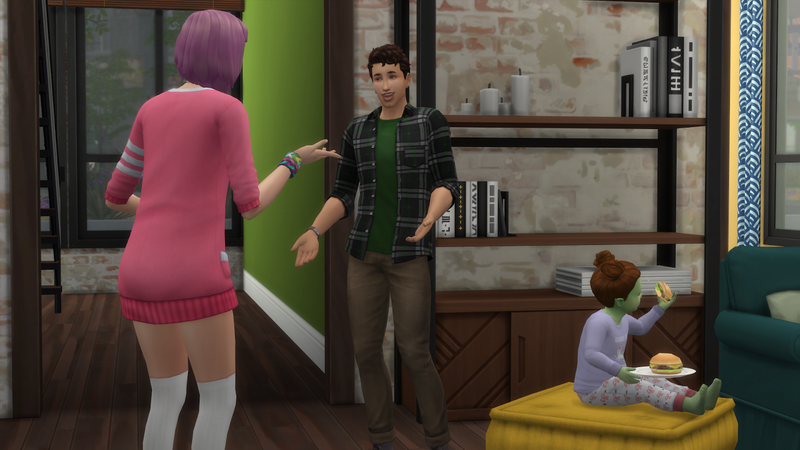 Jeff and Alec paid them a quick visit. Jeff mostly just hung out with Andy, while Alec did some chores around the house. I’m glad Alec’s smarted up since his delivery room shenanigans, even if he really should be at home watching his own kids while his husband enjoys a break after giving birth to two alien babies. Aside from the crib, the new nursery has not been decorated yet, so Luna takes it upon herself to decorate it for me. Kitty needed to be taken to the vet, and Miko ran into Jeff and Rocket while she was there. 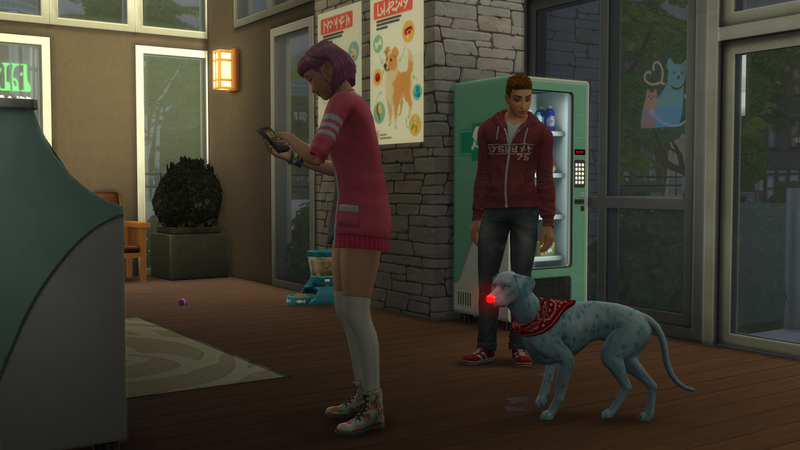 Rocket was doing just fine when I left him, but hey, he got cured before Miko left the clinic, so that saves me from taking a trip there next rotation! 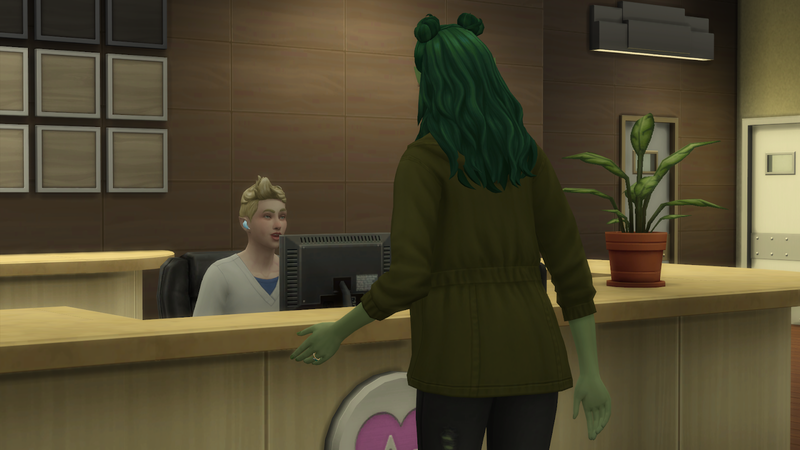 I’ve been having Andy go to work this rotation, since Miko’s at home job let her take care of Luna, however I maybe should have given Andy the last day off, because she got sent home early when she went into labour anyways. Felix was back at the hospital, still wearing his airpods, but now manning the front desk instead of the birthing machine. 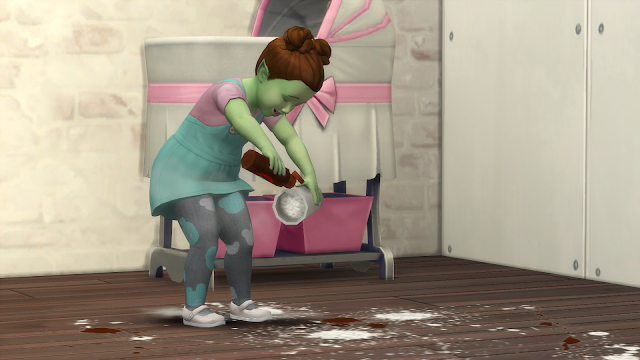 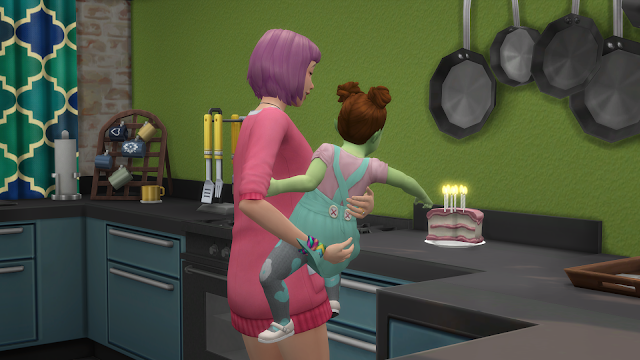 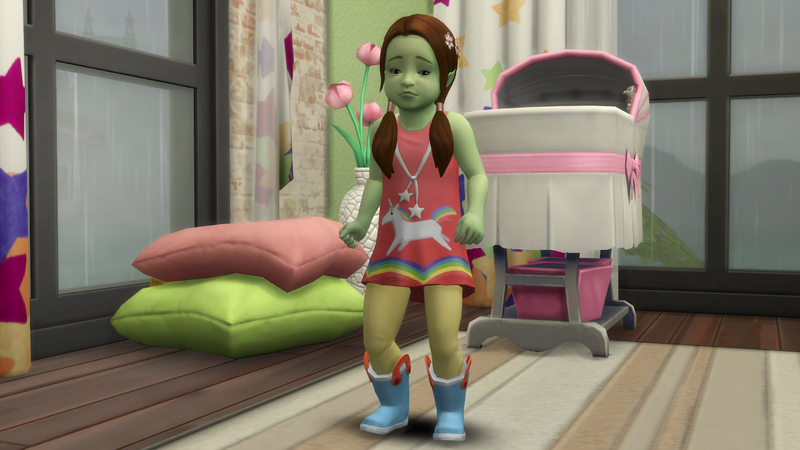 At this point in the rotation, Luna had managed to max out all her toddler skills, and was only a day away from aging up. 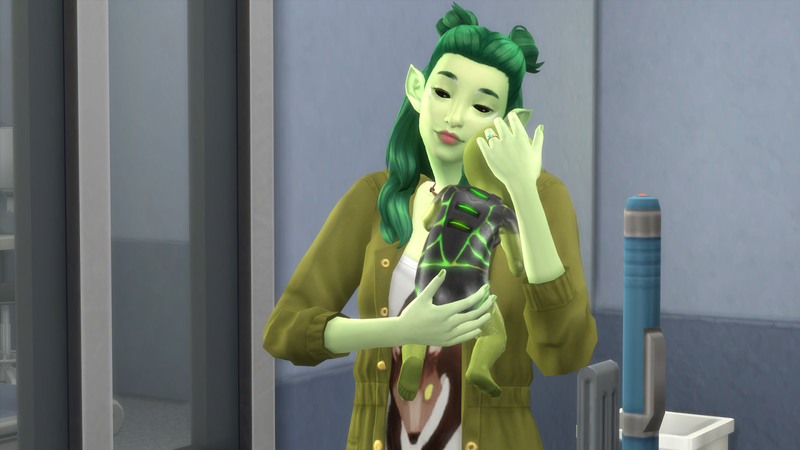 I wasn’t too sure how much she’d actually look like her moms, but she seems to grow up to be a pretty decent mix of Miko and Andy! 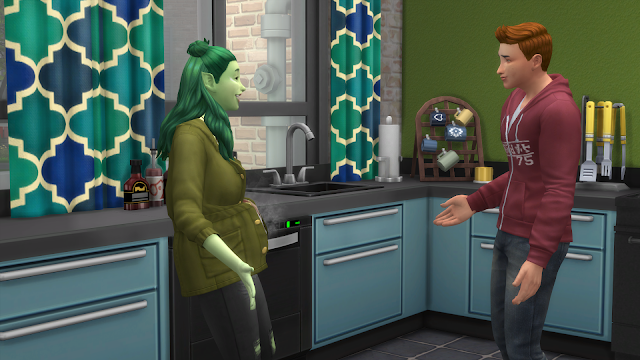 Jeff popped over to say hi, after texting her some congratulations on her birthday. 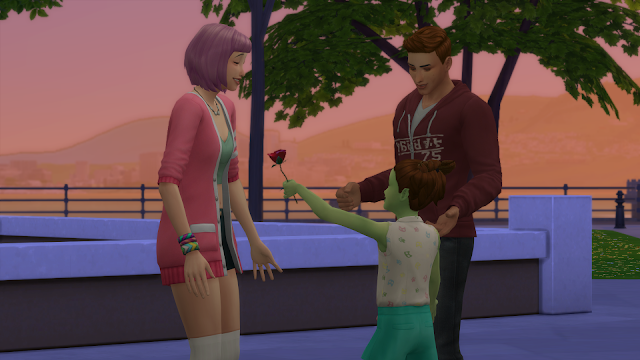 Luna’s birthday also happened to fall on Love day, so I didn’t really get to do any cute dates with Miko and Andy. I was able to have Luna give her moms some flower, at least. 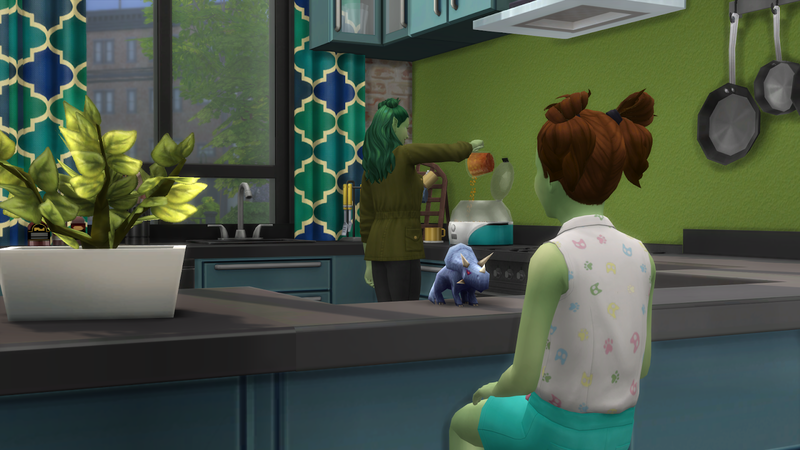 I was hoping that children would have slightly more interactions with babies, since they don’t really leave their crib? 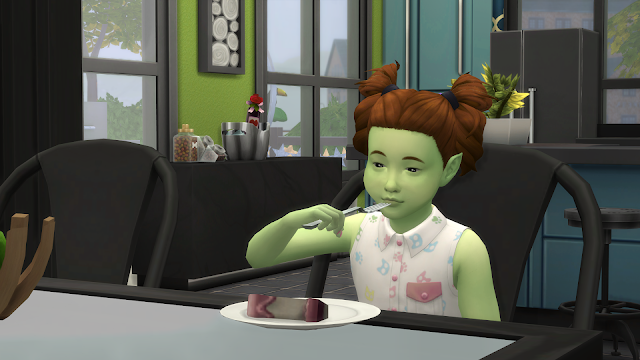 I waffled around on what aspiration to give Luna for a bit, then eventually settled on Whiz kid since Andy has the genius trait. 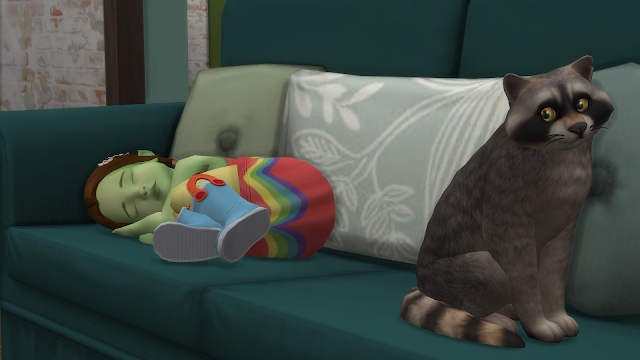 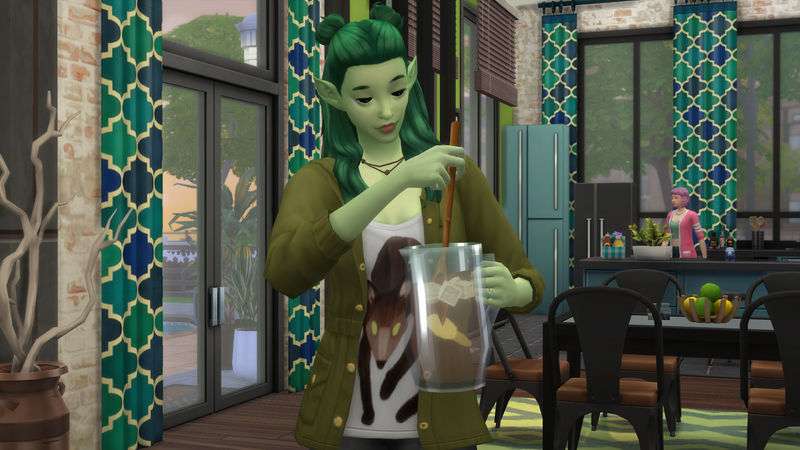 I rolled for her trait and ended up with ‘cat lover’, and I think my future plan for her might be to run a vet clinic, since I have yet to actually try owning a business in sims 4. 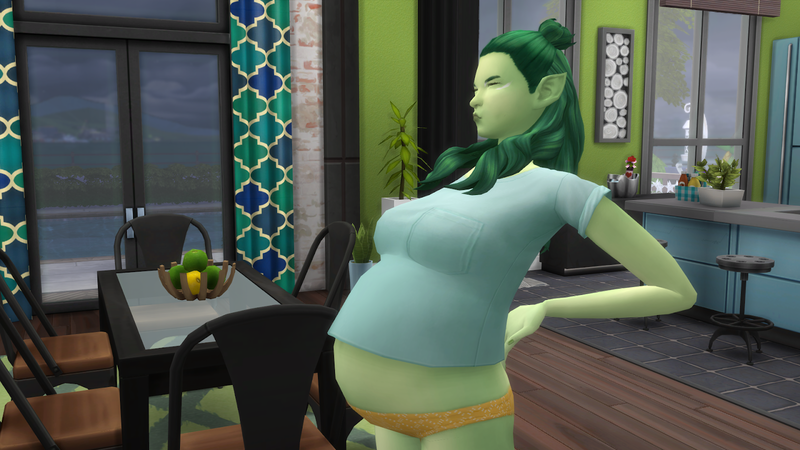 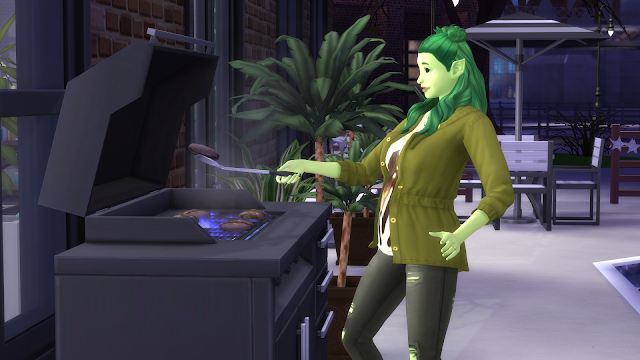 Ariel aged up at the very end of the rotation, which is great because now I can start having toddler playdates with her and Jeff & Alec’s twins next rotation. 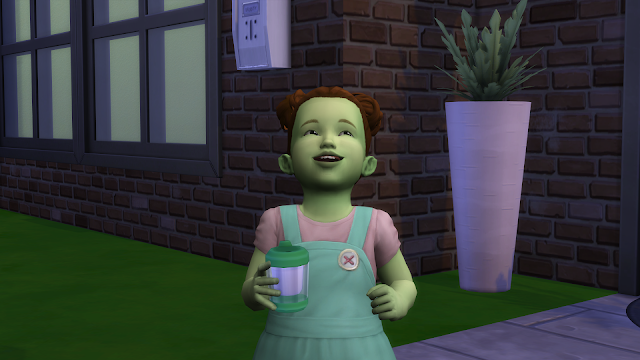 I went with charmer as her trait, and I’ll probably go with social butterfly as her childhood aspiration. Tried to send them out for a sunny day at the park, except it was pretty overcast until late afternoon. 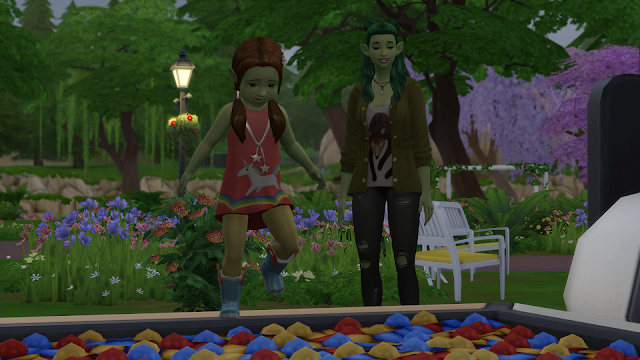 Ariel played a bit with the toddler playground that I hardly ever touch, mostly because it looks like garbage. 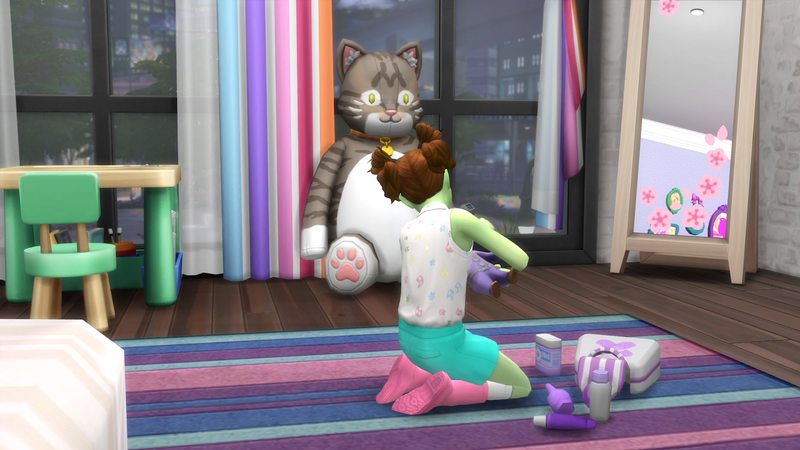 I mean, I think the animations are cute, I just wished the equipment itself looked nicer. 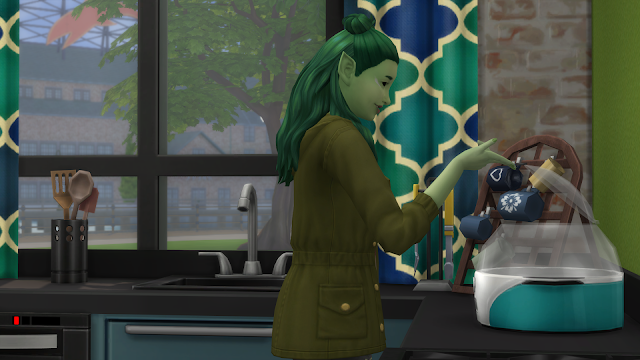 Some other things I have not used much is the popcorn machine from movie hangout stuff, and the juice pitcher from backyard stuff, although admittedly I hardly ever touch the other kitchen appliances like the tea/coffee pots, or even microwaves. I think I just need to throw more parties/hang outs to get the best use of the snack stuff. 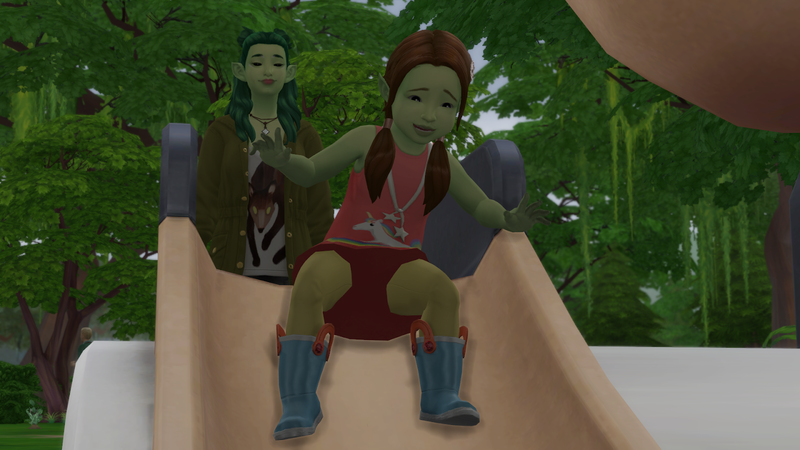 Thankfully they’ve got some warm summer weather coming up in their next rotation, so they can start throwing some pool parties! 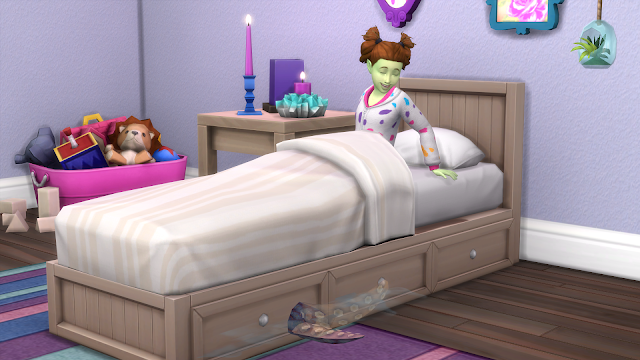 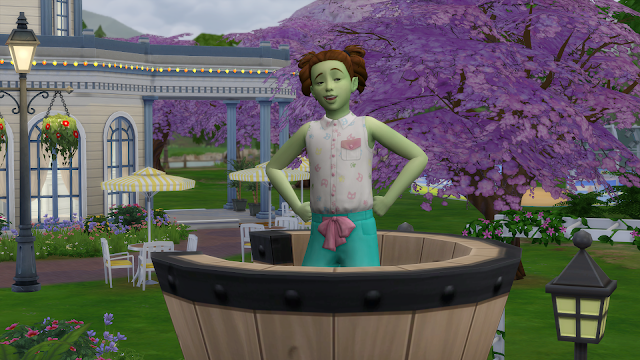 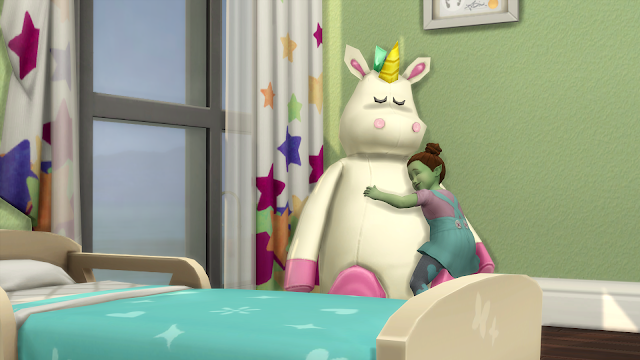 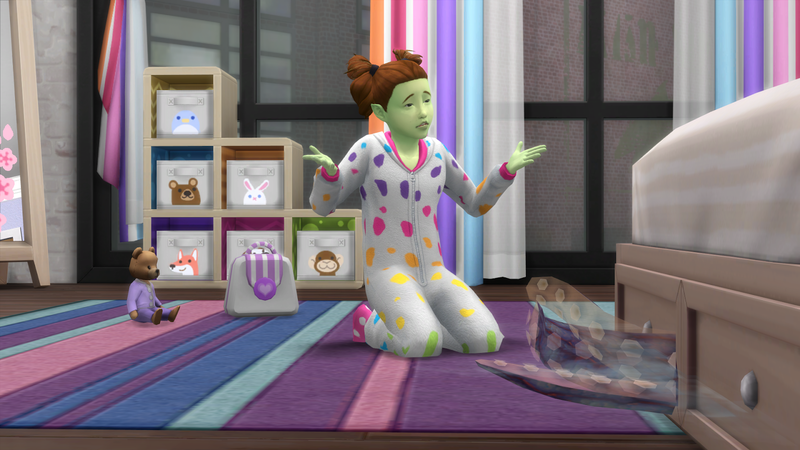 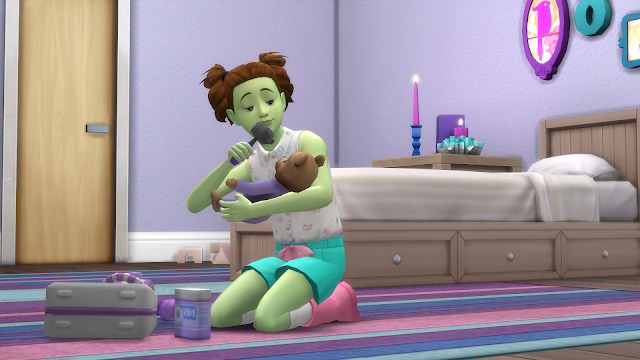 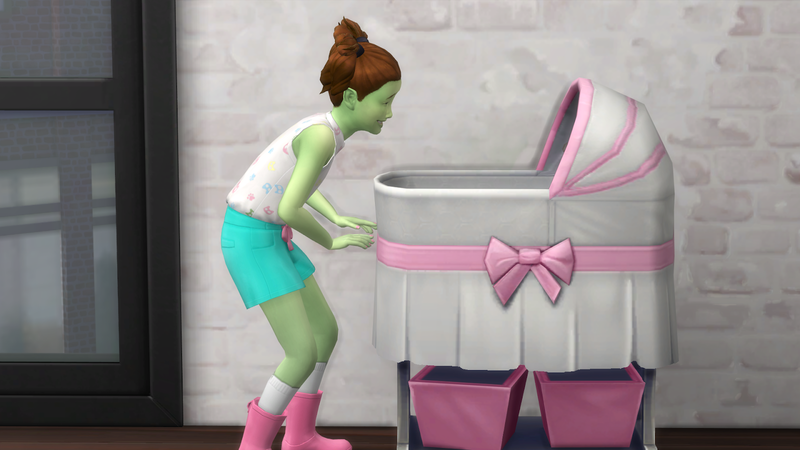 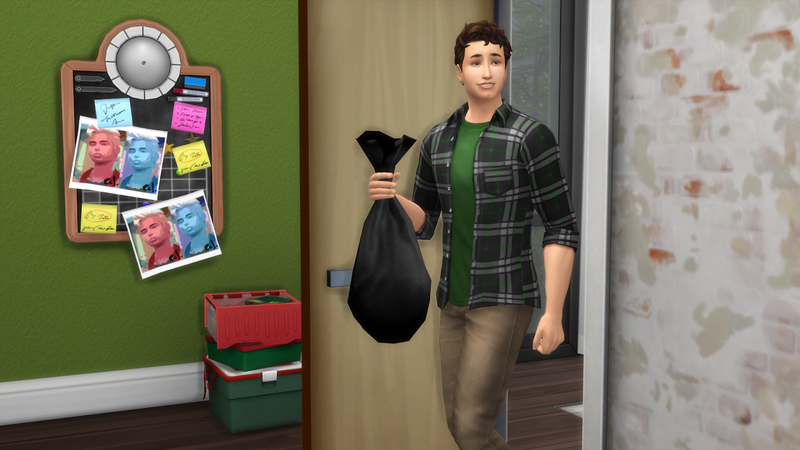 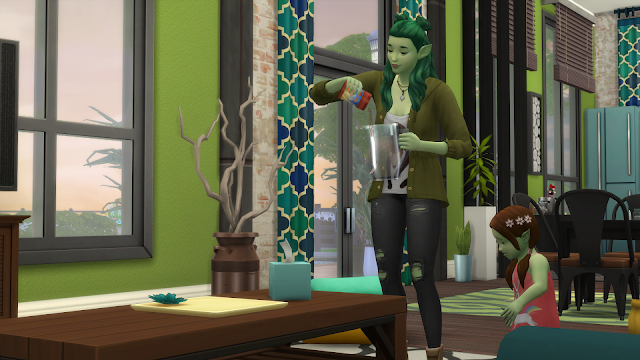 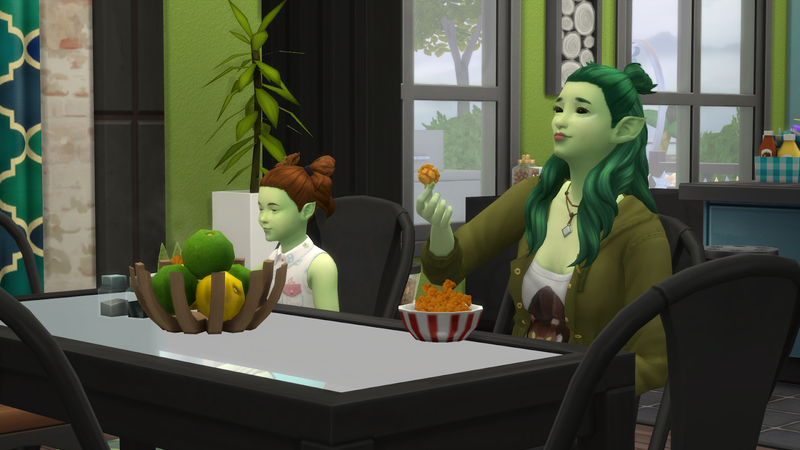 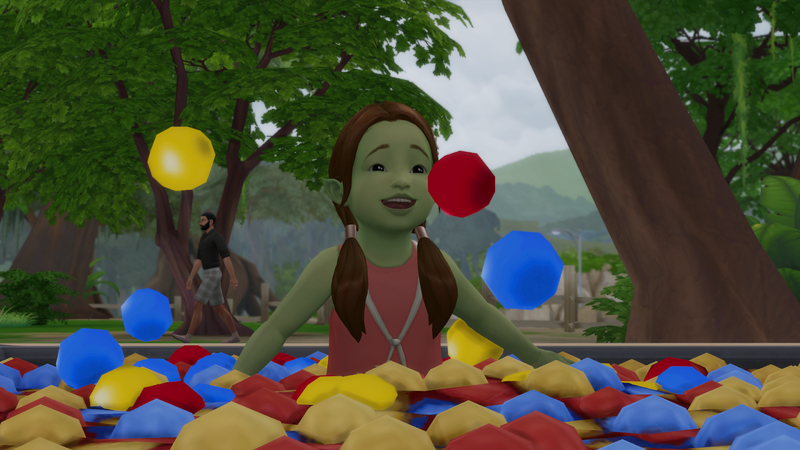 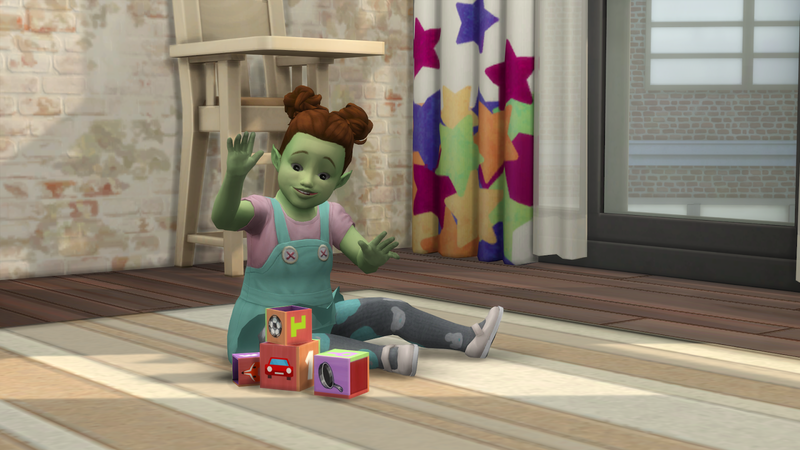 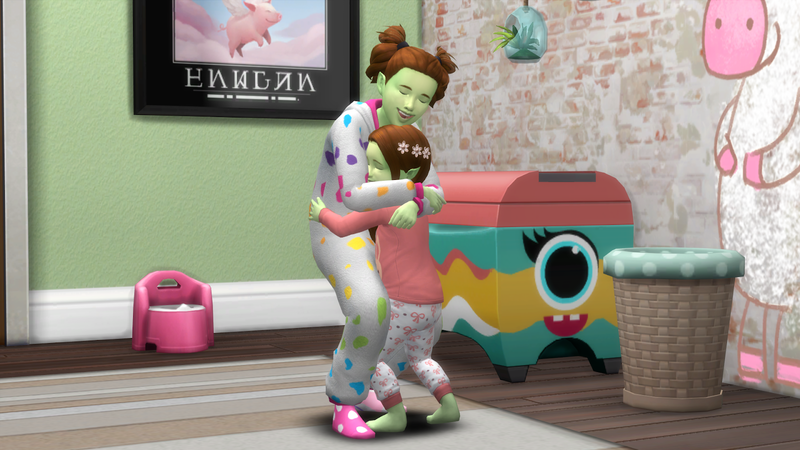 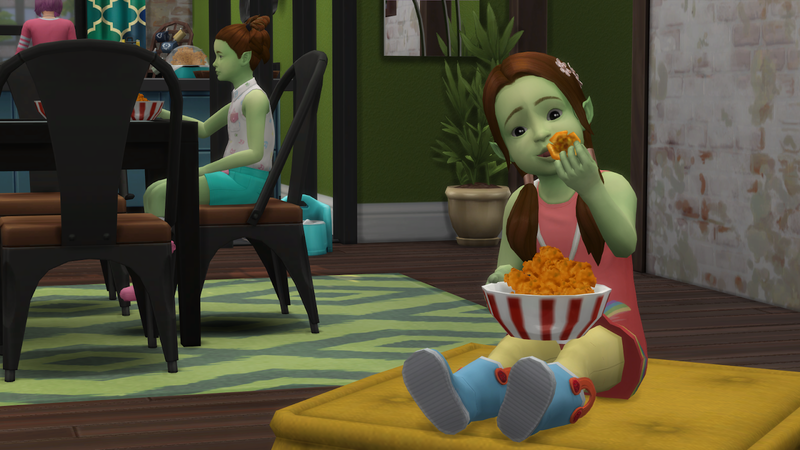 The rotation wraps up with Luna and Ariel just starting child/toddlerhood, and not much progress from either Andy or Miko on their aspirations. 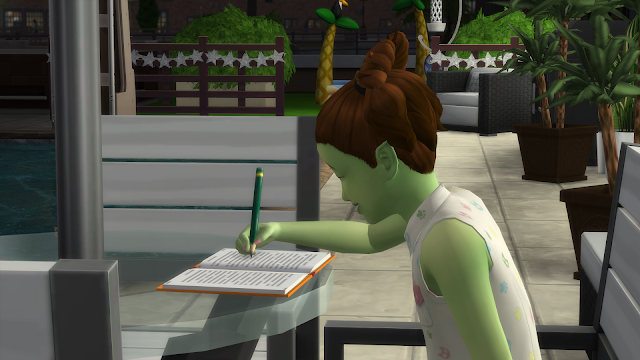 Andy still has to top her singing skill the finish her City Native one; I think she’s only at 7 so she’s still got a few points to go. 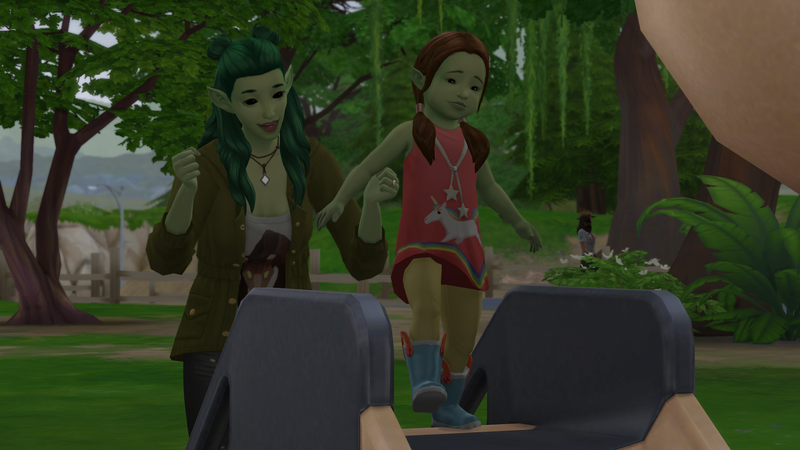 Miko’s doing alright on the Super Parent one; there wasn’t exactly a lot for her to do with Luna as a toddler, and it looks like there’ll be more opportunities for her to step in and parent now that Luna is a kid.